My next Halloween inspired nail design is definitely not spooky but the concept should have been one. This is actually a remake from last year's Colorful Skulls Nail Art. The difference lies on how the skulls were painted. I retained the idea of a skittle's manicure so I named this "Skulls Skittles". I used 5 light colored nail polishes for this nail art. My orange wasn't as light but after deliberating with myself, I figured it could somehow serve as an accent nail. I don't know if you will buy my lame excuse. If you like to recreate this, I recommend a more consistent hue on all 5 colors. You may view swatches and my review of these polishes here, here, and here. I applied each color in 2 coats and used acrylic paints and a detailing nail art brush to hand paint the design. This is a very easy design to make. I recommend this to nail art beginners who's looking for a simple Halloween nail design. Precision of brush strokes is at a minimum and it is not time consuming. Also, since you don't need perfect shapes for this design, working with your non-dominant hand would be manageable. Simply draw 3 vertical lines on your nail tips for the mouth, add irregular black eyes, paint 2 tiny lines for the nose, and add alternating white and black dots for further eye details. Perhaps you've noticed how I randomly painted the eyes on each skull differently. I wanted them to look crazy. To make this design scarier, probably a solid black for the eyes would make a lot of difference. October is almost done and hopefully I could squeeze in a few more Halloween nail art ideas. You may view my previous Halloween nail art ideas here. aahhh.. these r sooo cute!!! I like how the eyes on each one are different. :) Such a cool, cute halloween mani! 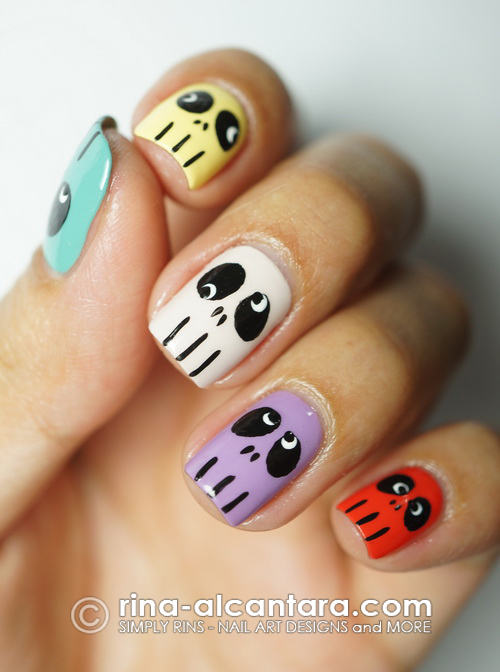 Your nail art is so cool, especially your Halloween designs! Know that every time you release a new one, you're making me smile a little more! thanks Rin!!! Ahhhh...! These are sooo cute! Holy cow! I love them! I love your designs. What brand of acrylic paints do you use? Could you take a picture of your supplies? I would like to see the acrylic paint and detailing brushes you use. Thanks!